The Main Lodge, a two story building that features grand views, and exudes a “ski lodge” atmosphere. The Lodge will accommodate up to132 guests (66 guest rooms). Guests enjoy all the modern conveniences with a touch of rustic atmosphere without sacrificing the creature comforts. 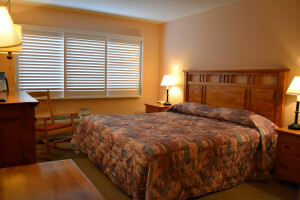 Guest rooms feature electronic key locks, two twin beds or one king sized bed, wall to wall carpeting, large windows offering scenic views, individually controlled thermostats for both heat and AC, and private baths with full tub and shower. Handicap rooms are available upon request and feature emergency call buttons, and a raised toilet seat and roll in shower. 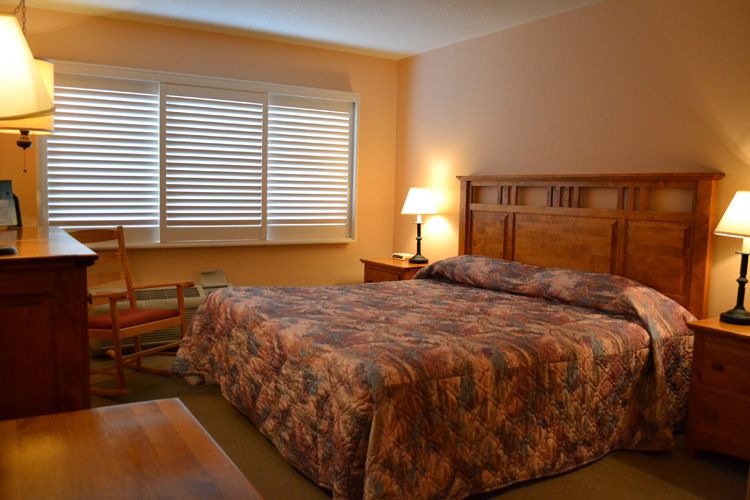 All guest rooms are equipped with sheets, pillows & blankets ,towels and washcloths. 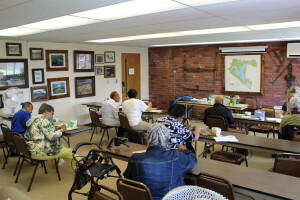 The facilities at The Salvation Army’s Conference Center at Ladore are ideal for groups or individuals. Just below the Main Lodge are the Annexes. These facilities allow for smaller groups, i.e., small church groups, couples retreat or family reunions; to take advantage of the great amenities of the Main Lodge yet allow them some seclusion from other guests. 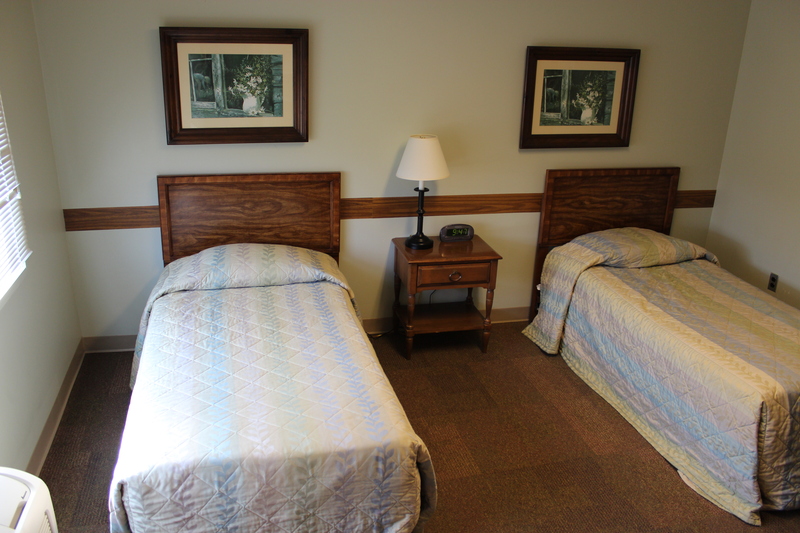 Each Annex features twelve guest rooms – four with two single beds, four with two full size beds, and four with one full size bed and two single beds. Every room features wall to wall carpeting, individually controlled heat and AC, electronic key card locks, and has a private bath with tub and shower, Plenty of parking is adjacent to each Annex. The Central Meeting Room/Lobby is equipped with TV/DVD/VCR, piano, comfortable lounge seating, and additional seating offering a variety of seating arrangements. The kitchenette features a microwave, mini refrigerator, sink, coffee pot and toaster. Just off the lobby/meeting room is a large screened in porch with grand wooded view. The central location of this room makes it easily accessible to all your guests. A lighted path leads to the main lodge where you can enjoy tasty meals in our large dining room, the grand patio, an enclosed pool, and a well equipped game room. In the Main Lobby you can relax by the double sided fireplace. Pull up a chair; grab a good book, sip a cup of coffee – no better place to enjoy some solitude or intimate conversation with friends.The friendly staff at the front desk are glad to answer your questions, provide forgotten toiletries, and ensure that your stay is an enjoyable one. In the Dining Room help yourself to a cup of coffee, tea or hot chocolate or cold drink any time of the day or night. Savor sumptuous meals, prepared in our kitchen and served buffet style. Tables of six and eight dot the entire dining room creating a wonderful space to gather. Special diets are accommodated on an individual basis. You will find the kitchen staff very helpful with any request for your specific needs. The dining room can accommodate up to 135. 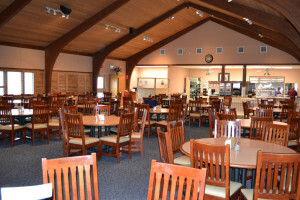 It can be expanded to accommodate up to 200 for weddings, luncheons, funerals, birthday parties, etc. The dining room has a sound system that is great for announcements or background music. The warm wood and decor makes this an attractive room to host any social event with minimal decorating needed. The Game Room is the perfect spot to enjoy billiards, ping pong, or darts. Ladore has a generous supply of board games and plenty of room to play or sit down with a small group. You can also use the video games or just watch TV. This area is open 24/7 for your enjoyment. When there is a group meeting in the chapel we request that game room activities be kept to a minimum as not to disrupt their meeting. TV Lounges on both the first and second floor allow individuals the opportunity to watch their favorite TV shows or sports teams. Although, we think you’ll find other guests more interesting. Just above the lobby you’ll find a modest exercise room with some gym quality equipment to keep you in shape while staying with us here at Ladore.